Whilst there were enough shocks and surprises to last a lifetime in the FA Cup, it was business as usual in the domestic leagues for the Manchester City contingent across Europe. This weekend marked a series of battles between City players past, present and future as two stars of our title winning squads lined up against one another in Italy whilst in Holland and Spain, our prospects were seeking to impress as they starred against some of their EDS team-mates. In Italy, Joe Hart suffered another nightmare night after letting in four goals away at Roma. At the Stadio Olimpico, Hart was reunited with former City forward Edin Dzeko and the English number one was unable to keep out his former team-mate as the Bosnian extended his impressive tally to 19 goals in Serie A this season. Despite making 3 saves in the match, Hart was beaten to his left for all 4 goals, reminiscent of Gareth Bale’s free-kick for Wales in the Euros. Hart has struggled to keep clean-sheets this season (4) with his last against Sassuolo on January 8th and with 7 goals conceded in their last 2 games, manager Sinisa Mihajlovic was forced to back his goalkeeper after criticism by reporters after the game. Over in Holland, the Manchester City trio at FC Twente continue to help their side push for a place in next season’s Europa League. Twente are now up to 6th after a 1-0 victory over 7th placed Heerenveen. Bersant Celina was back in the side after his 3-game ban and looked in fine form while 19-year-old loanee Enes Unal won the penalty which was dispatched by Klich. Yaw Yeboah was an unused substitute with the Ghanaian losing his spot to his City teammate Celina who celebrated ny posting a picture on social media with his former Norway compatriot Martin Odegaard, the 18-year-old hot prospect from Real Madrid. The second clash between City stars came in the second tier between Jong PSV and affiliate side NAC Breda. Oleksandr Zinchenko, who featured in the second half of PSV’s 3-1 win over NEC Nijmegen, was also in action on Monday night for the PSV reserve side. The Ukrainian international lined up against Manu Garcia, Brandon Barker, James Horsfield and Ashley Smith-Brown. And it was Zinchenko who was celebrating as his side defeated NAC Breda in a comfortable 2-0 win. The victory for Jong PSV leaves NAC Breda stuck in 8th place and struggling to maintain their promotion push in the Eerst Divisie. It was a quiet weekend in both England and Scotland for the City stars out on loan. Aaron Mooy was cup-tied for Huddersfield’s FA Cup clash against City which ended 0-0. Meanwhile, an early exit in the FA Cup against Burnley last month saw Jason Denayer have a weekend off as his Sunderland side jetted to New York for a mid-season break ahead of their clash against Everton this weekend. In League One, David Faupala was in action once again for relegation threatened Chesterfield who fell to a 2-1 defeat at home to Bury. In Scotland, Celtic extended their unbeaten run to 31 games with a 2-0 victory over Motherwell. Patrick Roberts did not feature in the 18 man squad and was pictured at Celtic Park watching from the side-lines. However, in the IRN-Bru Cup, Billy O’Brien was in goal for St Mirren as his side defeated Welsh champions TNS 4-1 to secure a place in next month’s final against Dundee United. Over in Spain, Samir Nasri continues to earn the trust of Jorge Sampaoli and featured in Sevilla’s 2-0 victory over Eibar. The Frenchman had a quiet game and was replaced after 70 minutes, however it is clear that he is an integral part of Sevilla’s side as they continue their push for the title and Champions League. Nasri has featured in 16 domestic league games this season, 4 more than last season under Pellegrini, and is believed to be comfortable at the club. It was reported that he is willing to cut his wages in half to stay in Andalusia and make his move to Sevilla permanent in the summer. Could the same be said for Eliaquim Mangala? The Frenchman was the best defender on the pitch in Valencia’s 2-0 victory over Athletic Bilbao – he made 6 clearances, won all of his duels and averaged an 85% pass success rate as his side earned a shock victory at the Mestalla. 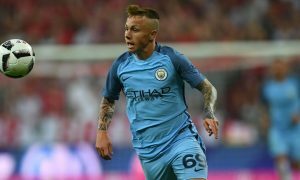 Meanwhile, in the second division, Pablo Maffeo was left on the bench as his side faced his current EDS and former Girona team-mate Angeliño, who featured for Real Mallorca. Girona defeated Mallorca 1-0 to stay 2nd in the Segunda, now 8 points clear of Cadiz.